The meerkat, also called the slender-tailed meerkat or suricate, is the only species in its genus Suricata. A small mongoose, it lives in large social colonies made up of several family units. It is often found in association with other mongoose species, as well as squirrels and various other rodents. What does a meerkat look like? It has highly developed senses of smell, vision, and hearing, and may sometimes be seen standing up on its hind legs, alert to danger. When a meerkat spots a predator, it will sound an alarm call to warn the others of the colony.. 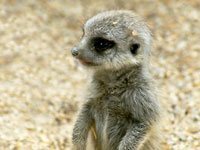 The meerkat has a long non-retractable, strong, 2 cm long, curved claw on the end of the meerkats fingers which the meerkat uses for digging underground burrows and the meerkats also use these claws for digging for prey. 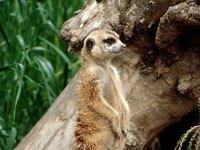 Meerkats have four toes on each foot and long slender limbs which along with the meekats curved claws helps the meerkat to climb trees when the meerkat needs to. The meerkats coat is usually fawn-coloured peppered with gray, tan, or brown with a silver tint. Meerkats also have short parallel stripes across their backs, extending from the base of the meerkats tail to the meerkats shoulders. The meerkat patterns of stripes are unique to each meerkat. 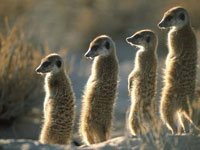 The meerkat inhabits all parts of the Kalahari Desert in Botswana and South Africa. 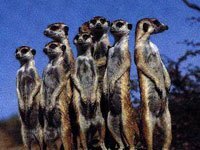 A group of meerkats is called a mob of meerkats, a gang of meerkats or a clan of meerkats. 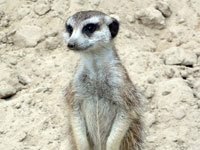 A meerkat clan often contains about 20 meerkats at a time, but some meerkat superfamilies have been known to have had 50 or more meerkat members. What does a meerkat eat? It has many chatterlike calls in its repertoire. During the night, it shelters in a multichambered burrow; in the daytime, it basks in the sun near the entrance or goes foraging for insects, small mammals, reptiles, birds and their eggs, fruit, and vegetation. Did you know this about meerkats? Native to the Kalahari Desert, meerkats have unique flaps of skin around their ears to keep sand out while digging. 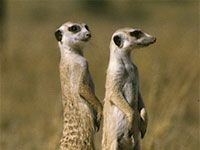 Some Africans call the meerkat the "sun angel," believing it protects their villages, stray cattle and lone tribesmen from the "moon devil," or werewolf. Meerkats rub millipedes in the sand before eating them. Doing so removes the toxins from the insects' skin. The meerkat has a relatively bare patch of black skin on its belly. It exposes this patch to the sun, typically in the morning, in order to absorb heat and warm up. Download free Meerkat wallpapers, click on the image to open the large version. Print free Meerkat coloring pages, click on the image to open the large version.